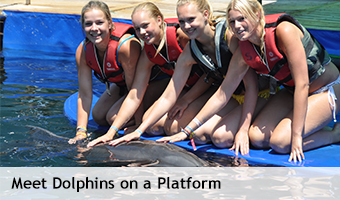 Come to Marmaris and join our swimming with dolphins program for everyone. 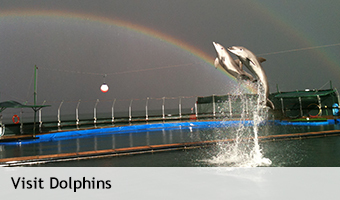 Our floating sea dolphinarium is open all the year round. Session times are daily at 09:30, 11:30, 13:30, 15:30 and 17:00. Each session last about 35-40 minutes. Basically no advance reservation is required. In high season (June, July, August) you should book on-site 2-3 days in advance due to high demand. The dolphinlagoon is located at the sea front, a 2min. 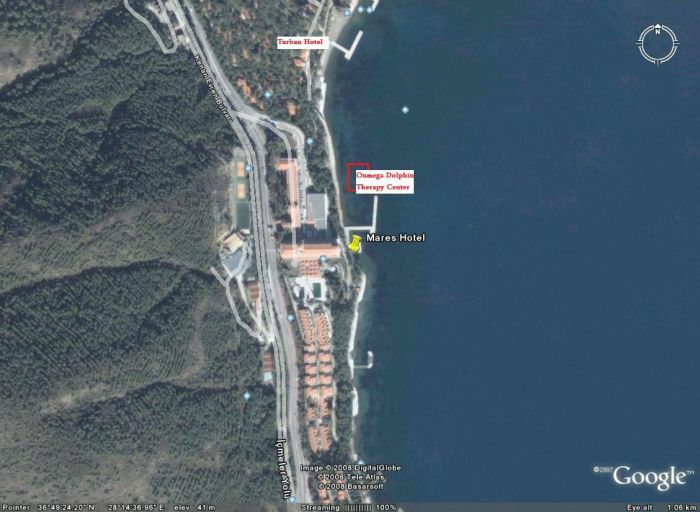 walk or 100m from the Labranda Mares Hotel and Club Turban Hotel. 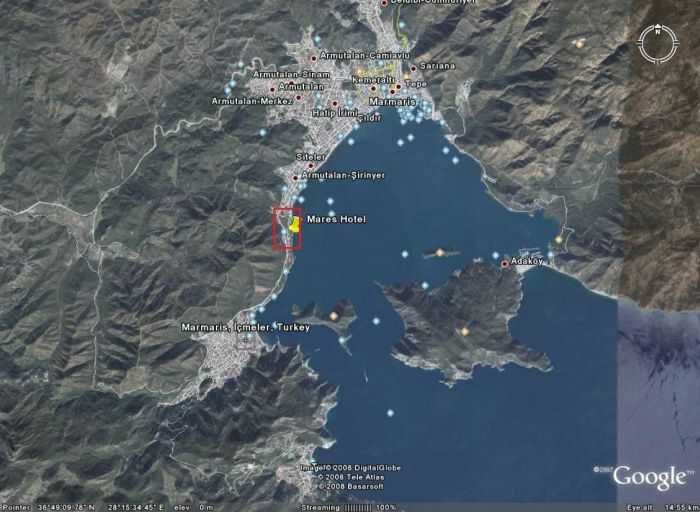 (2 miles from Icmeler, 3 miles from Marmaris Centre). Payments: At the waterside promenade, directly in front of our dolphin park, you will find a payment kiosk. Here you may make payment for your reservations in advance. Payments may be made in cash in Euro, GBP, USD, or Turkish Lira, or via credit card. Photography: Of course, you may take photos at no charge so you can take home a remembrance of your dolphin therapy. We also offer you the opportunity to purchase professional photos from a local professional photographer, approx. 150 photos on a CD for 50.00 EUR. Photo prints (DIN 5) are available at 10 EUR per piece. If you wish to purchase a video, we ask that you let us know when you book at the kiosk. The cost for the video is 80.00 EUR. All our sessions last about 35-40 minutes. Visit our open water Dolphin Park and see the dolphins, get a chance to learn about their behavior while watching interactive swim and meet programs. Take some memorable photos. Children under 6 years free, (must be accompanied by an adult). Show program: Daily at 5:00 p.m. a show program of a 20-minute duration is offered to visitors. If you’ve always wanted the chance to meet with a dolphin, this is for you! Join the trainer on the platform for 15 min- to shake flippers with your new dolphin friend! Give the dolphin a little backrub to experience what a dolphin feels like while the dolphin gets a chance to relax and enjoy! Dance, play with ring and ball, feed him fish, get kisses too. Includes watch program. Minimum age for meet program on the platform is 3 years. If you always had the dream to swim with a dolphin and learn about them in an unique way while spending exciting moments in their element, then join this program. Get kissed, touch and dance with the dolphin- your highlight will be a belly ride to maximize both yours and the dolphin’s enjoyment! After that everyone will enjoy taking unforgettable photos. Children of age 8-11 might swim only with one accompanied paying adult. Have you always wondered what it is like to be dolphin trainer? Make your dream come true and become a trainer for a day! See what it is really like to work with these magnificent animals and participate in all aspects of the job. 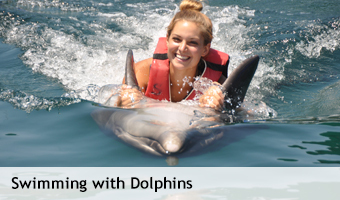 You will be paired up with a trainer and start your day preparing fish for the dolphins meals and giving the dolphins their daily vitamins, then come along and assist the trainer with training as well as play sessions with the dolphins. The trainer for a day program starts on any day you wish in the morning at 09:30 and finishes at 17:00. Included is one hour lunch with the trainer and at the end of the program you will get a certificate as a trainer for a day. 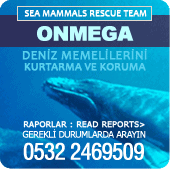 You follow the trainer the whole day and assist him in preparing the food, clean the fish kitchen, feed the dolphin, learn skills by training the dolphin and in the afternoon you will participate in a group swim together with the dolphin for about 35 minutes. You will get a chance to learn all the things you always wanted to know about dolphins and training, learn how we train our animals and get all your questions answered. Dont forget your swimwear! Lunch included. Minimum age for meet program on the platform is 3 years, 3-8 only in accompany with one paying adult. The swimming with dolphins for “everyone” takes place in a separate dolphin pool, which is only used for the touristic swimming with dolphins. The animals are specially trained to play and be pet by swimmers. Mental and physical health of each swimmer is required! Pregnant women allowed participating only in the meet program. All Participants of this program must wear a life jacket provided by us. Swimmers must be able to take an upright position in the water. Should you loose control of your body the trainer may take you out of the water and continue the program on the platform. In such case there is no refund. Same applies if the customer decides to interrupt the swim programme for any reasons. Participants exceeding 100 kg in weight cannot get the belly ride for safety of the animals. The use of any technical devices cameras, videocams or smartphones on the platform or in the water is prohibited. Any sun block- lotions- oils- cream or medical skincare should not be used before the dolphin swim. All jewelers such as necklaces, bracelets, rings and earrings must be taken off before the swim. Participants with overly long fingernails will be declined. Special care has to be taken not to touch the eyes or the blow hole of the dolphins. Experience unforgettable harmony with the angels of the seas and treat the dolphins with care as you would do with your own child. Времето, прекарано с вас беше чудесно и ползотворно. Сандра се прости със своето безпокойство и припряност. Вече е по-концентрирана, рисува по-продължително и по-качествено и играе настолни игри до края. Изразяването й също значително се е подобрило. Много сме щастливи, че бяхме на терапия.